Summer Snow is a low hour, well maintained, 450C Cummins powered Silverton 453 Motor Yacht that is a must see. She is a prime example of a well-cared for and maintained NE Yacht having lived her entire life pampered in brackish and freshwater since new. (Hudson River and St. Lawrence.) Previous and present owners have taken impeccable care of her and showered her with strict maintenance regiment and updates. Presently she lives in a covered slip. 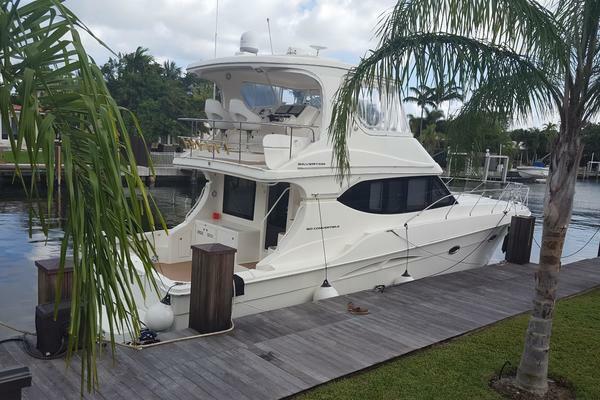 This yacht is a must see if you are in the market for a 45’ yacht. Walking aft along the starboard side, you have two options: either head up the five molded steps and settle in at the flying bridge or enter the cabin directly through a pilothouse door. And this is where you see the first of the 453’s real innovations. As you come in from the side decks, you arrive in the raised galley.. Silverton put the galley up high and fully forward in the cabin, so the chef can benefit from the natural light of five windows while still maintaining conversation with guests seated in the full-beam saloon, aft and below. The port-side galley is well equipped with a refrigerator and freezer, Toshiba microwave oven, and Force 10 four-burner electric range/oven. Counter space and drawers abound, and a console abaft the pilothouse door has three more drawers. Speaking of comfort, the 453 has it to spare. With a clearance height from waterline to radar mast of 19’5”, this 47-footer provides generous headroom in all areas below deck, making her one of the most spacious MotorYacht available in this size range. 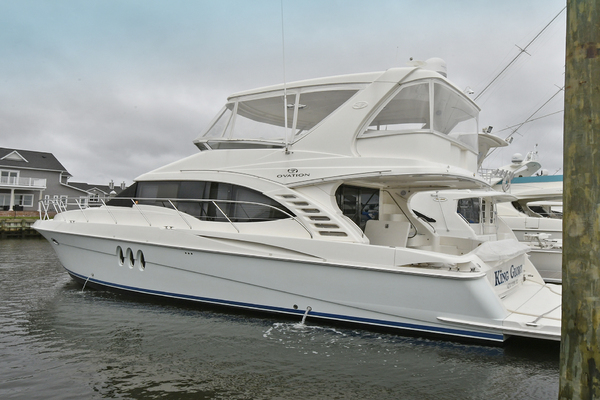 For example, the saloon has 6’7” headroom; making the room more appealing, it features an L-shape sofa with a recliner to starboard across from a second recliner and entertainment center to port. The owner’s stateroom is down a few steps from the saloon and fully aft, affording complete privacy. It has a centerline queen-size berth that you can walk around easily on either side. Fine cabinetry and drawers line the starboard side, along with a dressing mirror and full-length hanging locker. Over to port there’s a second cedar hanging locker and direct access to the en suite head with full-size tub and shower. The guests, meanwhile, reach their stateroom via a portside walkway lined with cabinets. This stateroom, just forward of the engine room, has an athwartships queen berth, again with full access on both sides. There’s a remarkable 7’ of headroom at the entrance, and that, combined with a vanity, full-length cedar closet and direct access to a second head with separate shower stall, really gives your guests the VIP treatment. Up in the forepeak, the standard layout features upper and lower bunks for the kids. The design has twin stairways leading down to the foredeck from either side of the flying bridge and recessed, 12”-wide side decks surrounded by a single-piece, welded, stainless steel railing for extra safety. The foredeck has two deep lockers on either side of a forward settee so you won’t have to lug fenders and dock lines all the way back to the aft deck for stowage. Anchoring should be easy for you, too, thanks to the Simpson-Lawrence windlass that’s hidden in the anchor locker, combined with the extended pulpit. 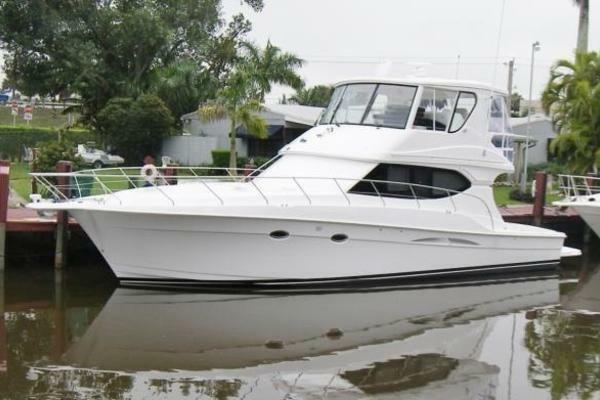 Our Silverton listing is a great opportunity to purchase a very nice 45' 453 Motor Yacht. 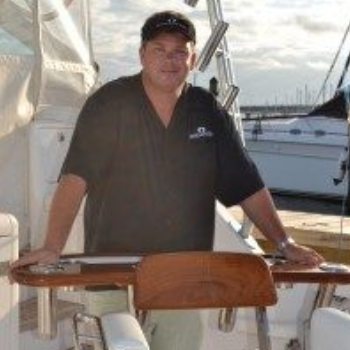 She is currently listed with United Yacht Sales broker Christopher Cooke who can answer all questions about the boat for you. Please don't hesitate to reach out to our team of professional yacht brokers to schedule a showing. There are many yachts listed for sale on the MLS each with a different history. We look forward to helping you complete your search for the perfect boat or yacht for sale.